This is a revision of a previous recipe. While it has a few more steps than the original, it doesn’t take much time at all to put together (less than 20 minutes). These steps were essential to creating the unbelievable flavor. Sautéing the onions and garlic creates a nice base. Allowing the dried herbs to toast and release some of their essence into the olive oil creates more flavor. And deglazing the pot with wine and burning off the alcohol from the wine are essential. In the end, this revision of the original recipe is far better than the original, and I’m excited for you to give it a try! Ragù is an Italian meat-based sauce that typically served over pasta or polenta. Whether a home cook is using beef, chicken, pork, lamb, or goose, the key to the sauce's success is that it is slow cooked. It is the perfect candidate for a vegan slow cooker recipe. While some of the traditional ingredients are kept intact, I definitely took some liberties. Jackfruit, dried porcini mushrooms, dried basil, garlic and dried rosemary create the legs of the ragù. Dried prunes add a subtle, sweet dimension to counter the acidic overtones of the dry red wine and tomato. At once, the ragù is complex and delicious. It tastes amazing over pasta or polenta. 1. In a dutch oven or large pot, add olive oil, onions, garlic cloves and a pinch of salt. 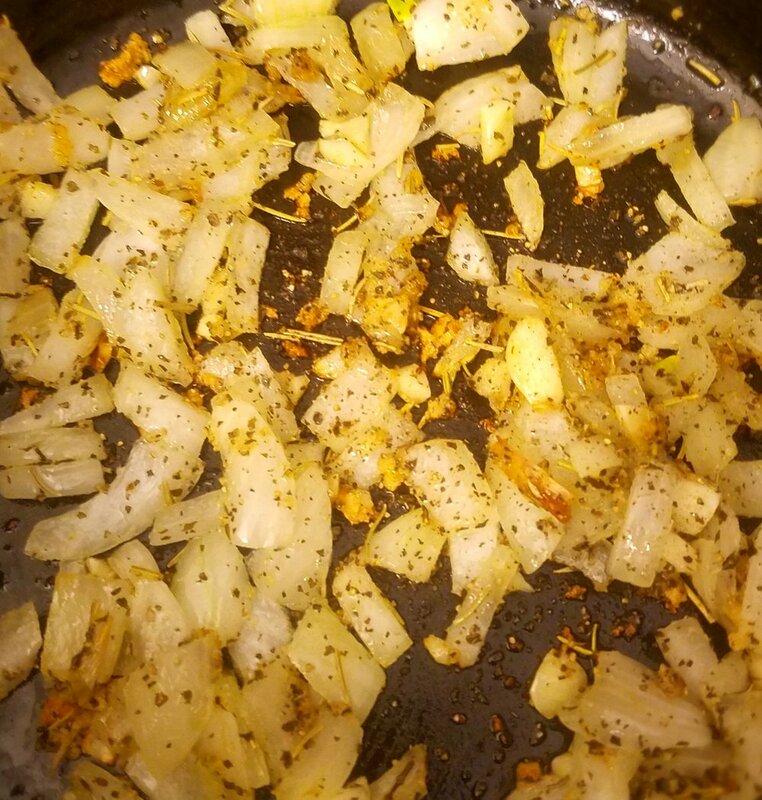 Saute over medium heat for about 3-5 minutes or until onions are a bit translucent. Add rosemary, basil, garlic powder and black pepper, and continue sautéing until the onions are golden. 2. Add red wine and dried porcini mushrooms over medium heat. Allow the red wine to reduce by 50% volume, and stir every now and then. This will deglaze the pot, and also allow the alcohol to burn off. It will happen quickly (within 3 minutes or less). Once the wine is reduced, add the broth and tomato paste. Mix together and remove from heat. 3. 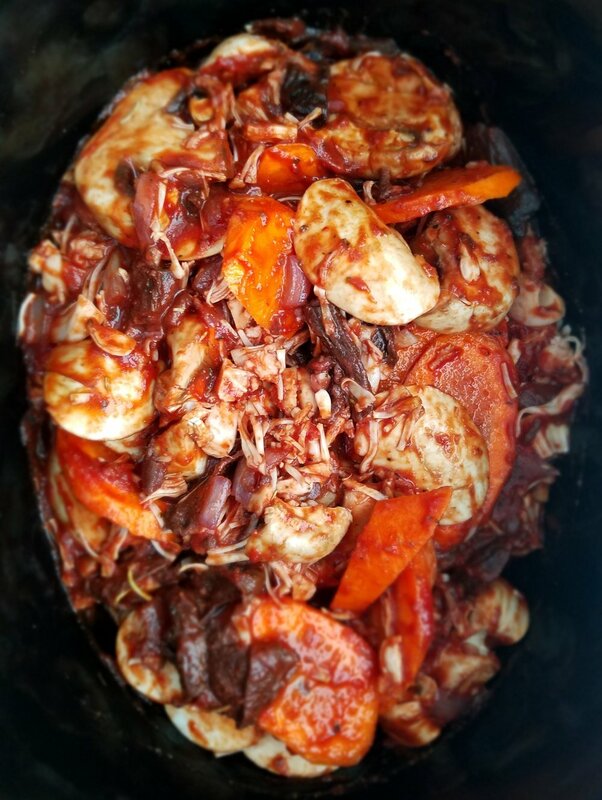 Add the sauce, shredded jackfruit, white mushrooms, carrots, and prunes to a slow cooker. Mix thoroughly. Secure the lid, and cook on HIGH for 4-5 hours. Remove the lid. If the prunes have not disintegrated, break-up them with the back of a wooden spoon to fully integrate into the sauce. Serve with your favorite pasta or on top of polenta.